Considering the 8 hour time difference Tam and I do well to get about 5 hours sleep. We both wake up at 2.30am! We then doze on and off before getting up at 5.00am along with the girls. We all have showers and organise the suitcases before going for breakfast in the lobby of the hotel. Its continental style, but very good. There is a choice of cereals along with toast, pastries and fruit. Tam tries the maple and brown sugar oatmeal and immediately proclaims it gorgeous. Her exclamation of pleasure goes clear off the scale with the banana bread oatmeal. Suitably sustained we pack up the car and head north on the 405. The preferred choice of CD to start off this mornings entertainment is Rock Monsters, a compilation of great rock music from the past 30 years. The ladies decide that head banging is not suitable and decide to do the Degu Dance. For the poor souls ignorant in the ways of the Degu, it is a small Chilean rodent not dissimilar to a squirrel crossed with a hamster. Georgia has a couple as pets and, apart from attempting to nibble their way through any piece of furniture laid in their path, are entertaining little devils. Anyway, this dance appears to consist of raising your hands in front of you in a squirrel like manner and bobbing your head back and forward. Not a pleasant sight for the poor unsuspecting American motorist making his way to work as he catches a glimpse of 3 deranged females in a Chrysler 300 acting as though the local home for the mentally unstable is having its annual outing. One or two of them glance my way and shake their heads in a sympathetic manner. As we approach the Sequoia National Park the landscape changes and becomes hillier with increasing vegetation. At 9.15am we pay our $10 fee and enter the park. The first stop is just inside the entrance to see a river tumbling down from the mountains. This is just a taster of things to come. Once inside the park the road becomes incredibly winding and we spend most of the time below 30mph. This isnt a problem; in fact its a good thing as it encourages you to take your time as you meander ever upward through the mountains. Amphitheatre Point is next. So called because it gives a 180-degree view of mountains and deep valleys. We are already gobsmacked. 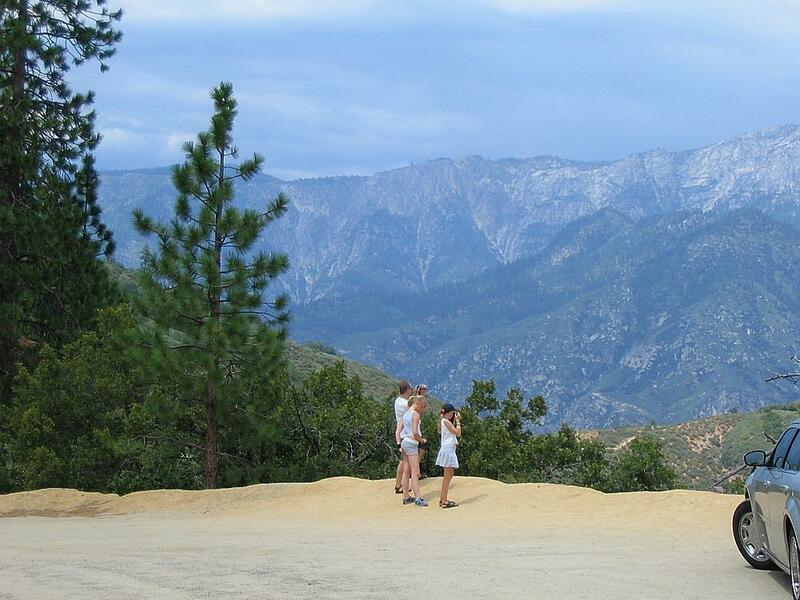 You can see Moro Rock from here. This is a completely bare granite outcrop stuck on top of a mountain. From here we cant work out how anyone could possibly reach the top as it stands 6,725 feet tall. I guess well find, out were going there soon. We enter the Giant Sequoia Forest, which needs no explanation from me. You get a bit blasé about it all after a while. Look! Thats a huge one. 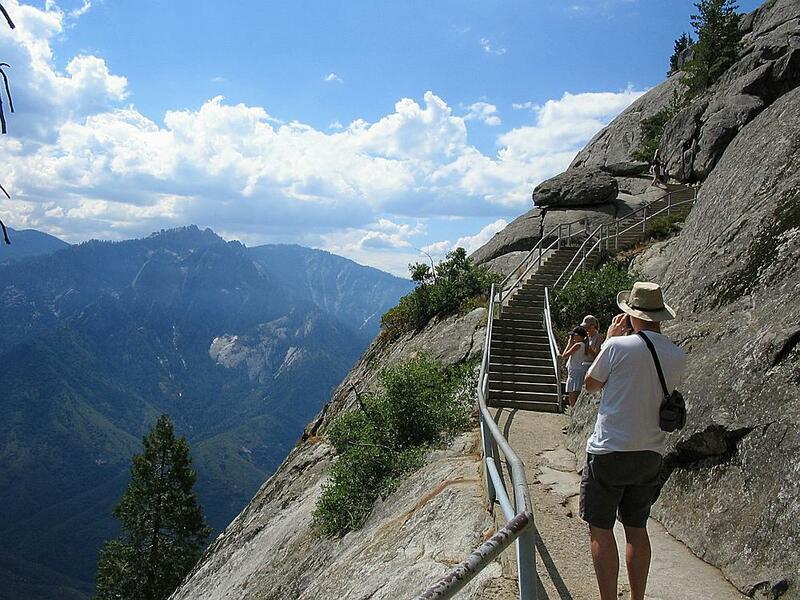 We arrive at the base of Moro Rock and begin the trek to the top. It involves a lot of steps and some fairly low handrails protecting you from a certain and rather messy death. India and Tam are not keen on heights and pin themselves to the wall of the rock like leeches. Georgia and I raise our eyebrows and continue with the serious business of getting to the top. Believe me, its worth the pain. 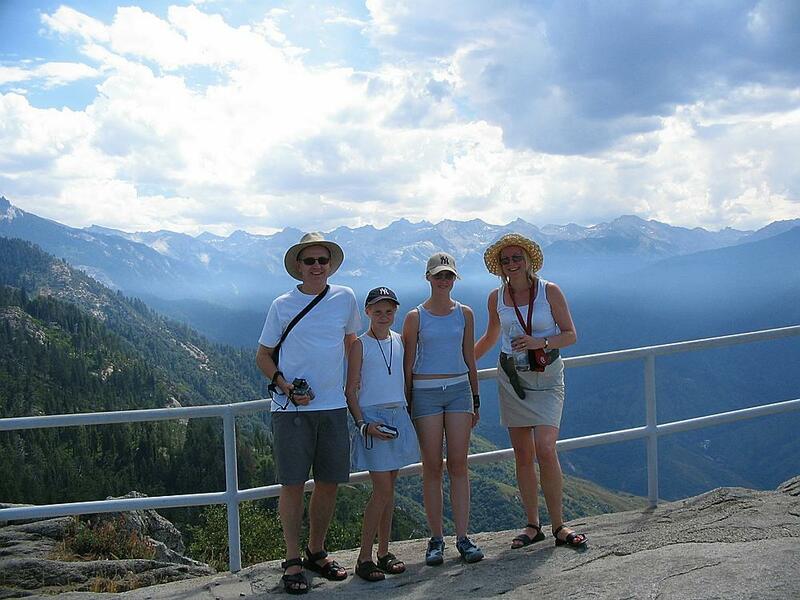 At the top of Moro Rock you get a 360 degree uninterrupted view of mountains and canyons that is simply beautiful. We spend a while up here trying to commit the views to memory. Hey, we dont need to do that. Weve got digital cameras and camcorders. The trek down is easier than the trek up. We recently bought a camera with one of them fancy panoramic facilities. Works quite well. 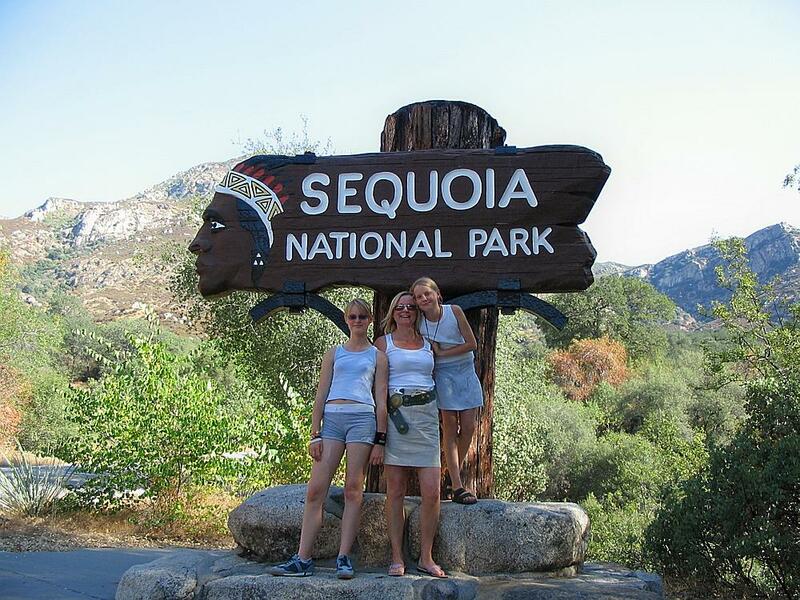 Back to the car where we have the obligatory photo at Tunnel Log where you can drive through a felled Giant Sequoia. 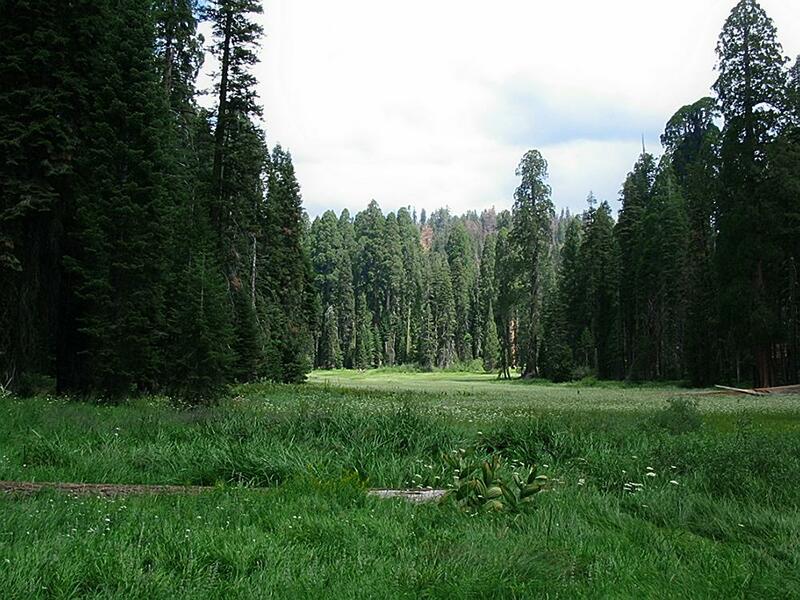 This is turning into a bit of a travelogue, but the next stop is Crescent Meadow where the huge trees give way to a meadow filled with grasses and white flowers. Beautiful as it is, I can imagine it must be even more wonderful in the spring. 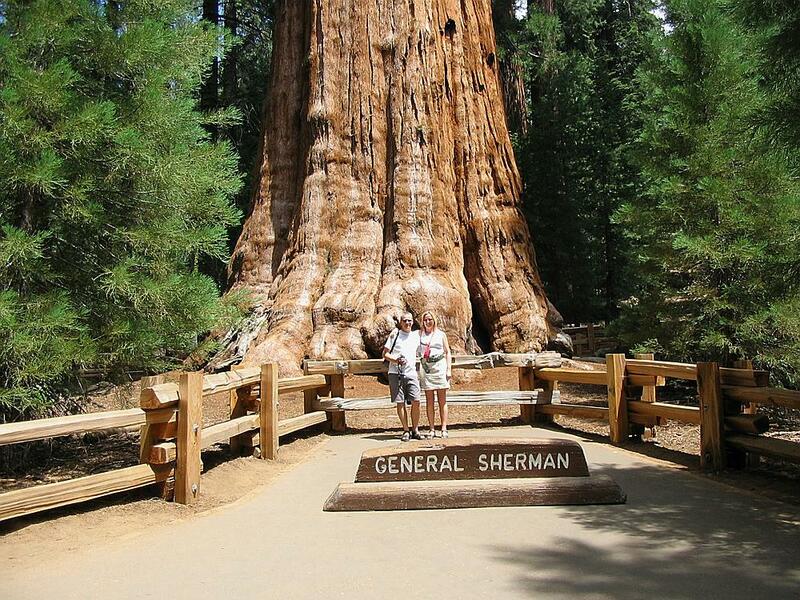 On the road again until we reach the General Sherman Tree, the single largest living thing on earth. Big doesnt start to describe it. The girth and length are amazing. (Words that are not new to my ears). The base of the trunk is vast and it continues in the same vein as you slowly move your eyes up until your head is as far back as it will go. Falling over backward at this point is considered uncool. This monster is somewhere between 2,300 and 2,700 years old. Now, that is a mean tree. This picture does doesn't do it justice. It's enormerous! (I'm talking about the tree). Its getting towards lunchtime now so we stop in Lodgepole to pick up some rolls, ham, cheese etc. to make our lunch while stopped in a picnic area. Things dont go quite to plan as it starts to rain quite hard and we have to sit in the car and eat. Not elegant, but it serves its purpose. A few more miles down the road and we begin the descent into Kings Canyon. I dont know if I can adequately describe this. The road winds backward and forward getting increasingly twisty as you travel downward for 8 miles. Every mile seems to produce an even more stunning vista as the sheer face cliffs tower above you. I comment to Tam that the only thing that has been scarce today is water. Not much in the way of the old rivers. Lo and behold we turn a corner and there is the mighty Kings River cascading over rocks before our very eyes. Nature 1, Stringer 0. The road continues along the bank of the river for several miles until we pull in to look at Grizzly Falls. Now we had read that the best time to see waterfalls is in the spring and that by summer there is nothing much left but a trickle. If this is a trickle then I dont want to be near a raging torrent! Its spectacular enough as it is. Back a little. A little bit more. A little more. Sploosh! He, he, he. 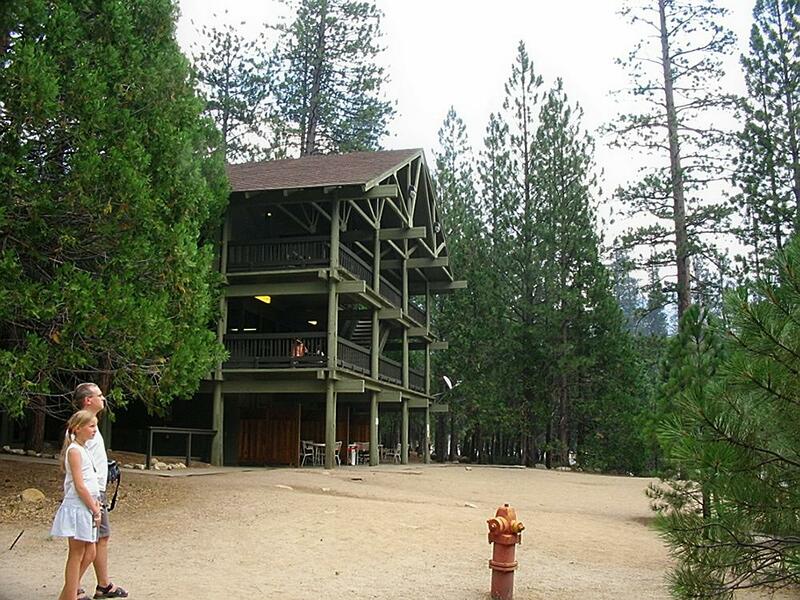 We are staying the next two nights at the Cedar Grove Lodge and we book in at 3.00pm. There is not much in the way of accommodation in the floor of the canyon unless you are prepared to camp. Perhaps this is a good thing, high-rise hotels would definitely be out of place. From the outside the lodge is ok, rustic in a Wilderness Lodge sort of way. Inside the rooms are somewhat basic. Clean, but showing their age a little. There is no telephone and (gasp!) no TV. There is much wailing and gnashing of teeth and a mutiny looks on the cards. It is only the fact that I raise myself to my full height, put on my strictest voice and say Please dont be upset, it not my fault that a catastrophe is averted..
Kev and Georgia admire the beautiful fire hydrant. No time for relaxing, we are on the move again, this time to Roaring River Falls. 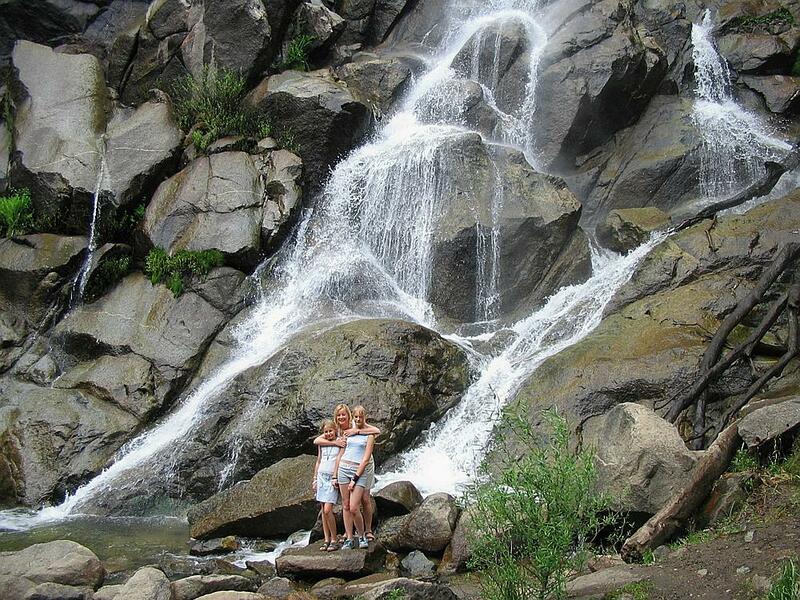 This is a different type of waterfall to Grizzly Falls, broader but not so high. Its still lovely though. Zumwalt Meadows is next. The river running alongside is more spectacular than the meadow, which is probably suffering a little in the heat. By the way, the rain stopped long ago. Its a little overcast, but still hot, in the low 90s. Our final stop before returning to the lodge is at Roads End. As the name suggests the trip into Kings Canyon is one way and this is the end. We park and walk the few yards to the river, which is much gentler and broader at this point. Here we stand atop John Muir Rock, named after the famous naturalist and environmentalist who did so much to help preserve this amazing part of the world. Some hardy souls have been jumping into the river from here. We prefer the gentler pursuits of paddling in the shallows. My lord that waters cold. 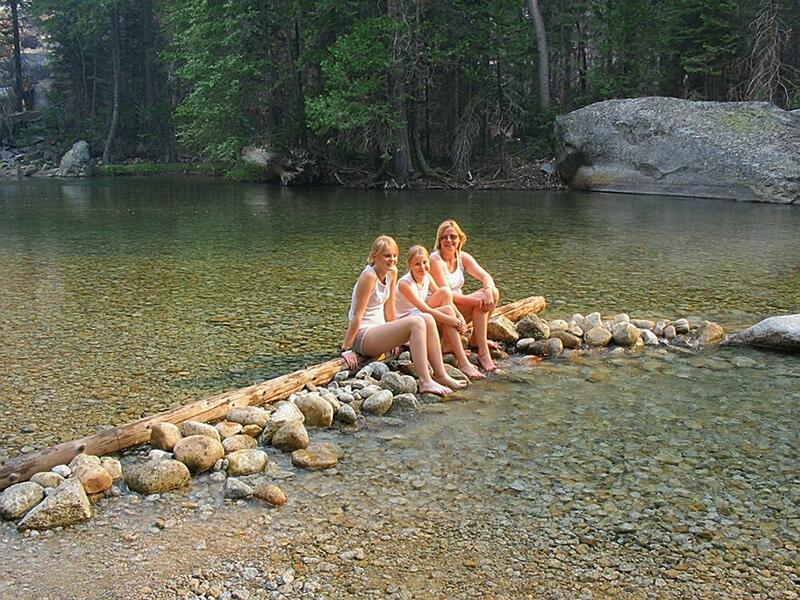 If the General Sherman Tree had fancied taking a dip in this water its girth and length would have been drastically reduced, I can tell you. This place is another incredibly beautiful and quiet spot. Back to Cedar Grove Lodge at 6.00pm. We have covered 220 miles today, much of it on very slow and winding roads, but I wouldnt have missed a minute of it. 3 beers are despatched while I work on my trip report. Thirsty work all that driving. The girls entertain themselves listening to their portable CDs and playing cards while Tam lies comatose on the bed. In the evening we eat in the café in the Lodge. This is partly due to the fact that Ive had 3 beers and partly due to the nearest eating establishment being 30 miles away. The café is a bit of a greasy spoon. Think Formica, plastic and bright lighting. The food is also a little over priced. We have chicken strips, ribs and twice cooked pork. I presume it was still raw after the first time. The bill with drinks is $50, but this is a counter service restaurant. To be fair the food is reasonable and we sit on the outside balcony at a table overlooking the Kings River. The décor might not be sophisticated, but the view is. While we are waiting for our food several very dirty young men come in. Tams first thought is They could have washed first, but it turns out they are fighting a forest fire and are just taking a brief break to get something to eat. You must have to know what youre doing in that line of work. well, there is no after that. So its back to the room to read, drink beer or play cards, whichever is your preference. So, what is my highlight from a day of highlights? For me, the drive down the mountains into Kings Canyon was amazing. And we still have the jewel in the crown to come. Yosemite.